Amoveo Ireland is part of Amoveo Group. Amoveo, a Latin word meaning “shift” is an appropriate name, as Amoveo Group is committed to bringing about social and personal change through a concept known as Collective Impact. Collective Impact is based around the idea that deep and lasting change is best brought about by uniting the efforts of multiple people, initiatives, and organizations. Amoveo Ireland’s mission is to bring this vision to the people and communities of Dublin, Ireland. The Linn family’s journey toward becoming international workers began during the summer of 2014, when Ben and Dorine were visiting Dublin. During this time, their eyes were opened to the practical and spiritual needs of the people. After months of following up and praying, they were able to connect with Amoveo Group and have a conversation about launching a new site in Dublin, Ireland. Ben and Dorine Linn met and married in Northern Nevada in the late 1990s. Ben was studying Logistics Management at the University of Nevada, and Dorine was studying Elementary Education. Both were involved with different ministries – Ben leading worship and Dorine teaching children’s Sunday School. 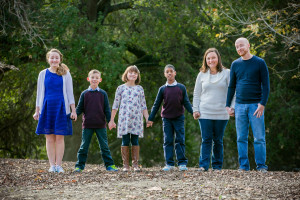 After they got married in July of 1999, God began to work in their small family in many ways. The most noticeable was the population! Becca (b. 2002) has felt for a long time that God was calling her to be an international ministry worker. David (b. 2004) is a self-proclaimed “jock”, and you’ll find him playing baseball or other sports hours every day. Maya (b. 2005) loves animals and art, and she enjoys spending time with friends and family. Ezekiel (b. 2006) joined the Linn family in 2013 and likes the three S’s: spiders, sharks, and Star Wars. Ben still loves serving in music ministries. He has also come to enjoy leading a small group and encouraging brothers and sisters in the Word. Dorine earned a Master’s Degree in Marriage and Family Therapy, having a heart for children and families. She is a great counselor, and she has a heart for the broken and the overlooked. Your tax-deductible donation helps to support, maintain, and grow this ministry. Be sure to select "Ben and Dorine Linn" in the Designation box.